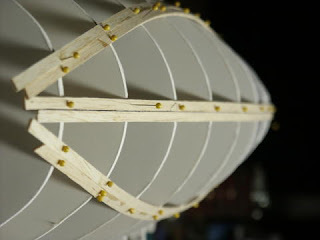 Installing the balsa planks on the foam shadows. Today we installed the shadows on the building board and lined it up straight and square (I hope!) 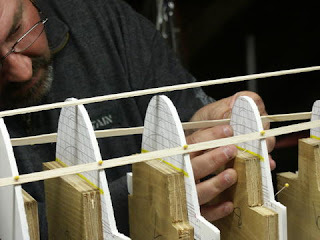 We also laid down 2 balsa planks on both port and starboard sides on the designed waterline. After laying these 4 planks down, we scored, trimmed and beveled the two planks that run on either side of the center-line. 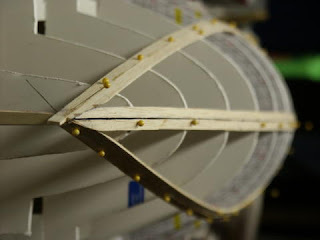 Check out the detail on the stem, the 2 planks along the center-line meet up snug with the 2 planks on each water line. Nice work for an "old man", hence the reading glasses! Too bad your girlfriend is lacking the same obsessive traits as you! Hee! Hee! Be careful with the power tools. I don't know if this will qualify any longer as a He-man blog. I know she is a nice girl (maybe too nice for you), but this IS a he-man, woman-hater hobby! And you told her where your blog is? ?